Wash the rice thoroughly and soak it for 30 minutes. Put on the lid of the pressure cooker and cook for 3 whistles. Remove the lid once the pressure subsides. Use a fork to fluff the rice gently. Be careful not to break the rice grains. Use this rice for any rice preparation. Boil 2 cups of water in a pan and add the rice to it. Close the pot with a lid and let it cook on low flame. Once the rice is nearly cooked, switch off the flame. Let the rice sit for 5 minutes, and then open the lid. Fluff the rice carefully with a fork. Hyderabadi Chicken Biryani is famous all over India and around the world and it is by far the most popular Indian rice recipe. Hyderabadi Chicken Biryani is extremely easy to prepare. All you need to do is marinate the chicken and then cook the chicken and rice in a slow steam process in order to retain the aroma and flavors of the spices. This is a flavorful, delicious and tasty Indian rice recipe that forms a complete meal by itself. The prolonged marination already softens the chicken, so it does not take too much oil or ghee to cook. The recipe does not involve any deep frying or sautéing, the entire cooking is done using steam. The flavorful and appetizing Hyderabadi Vegetable Dum Biryani involves a combination of aromatic basmati rice, assorted vegetables, flavorful spices and herbs – all of which are slow cooked to perfection. It can be enjoyed by itself with raita or with a side dish of paneer or mixed vegetables curry. The plethora of vegetables such as capsicum, carrots, green beans, cauliflower, nuts and raisins used in this recipe boosts up the nutritional value of this vegetable dum biryani and packs it with antioxidants, fiber, vitamins and minerals. Kashmiri pulao is a simple, light and flavorful Indian rice recipe that marked for its distinct yet mellow flavors and slight sweet taste. The pomegranates, raisins and nuts create a nice chewy texture and add some sweetness to the rice. This mellow spiciness of this dish makes it suitable even for kids and elderly people. The best thing about the Kashmiri Pulao is that is makes minimal use of spices which helps to keep it light. The fresh fruits and raisins included in this recipe enhance its nutrient profile and supply some essential vitamins, minerals, antioxidants and healthy fats. The fluffy and soft Matar Pulao or Peas Pulao is extremely easy to prepare and it can be made in a pressure cooker or pot. It is the perfect comfort meal for a weekend lunch that goes well with both veg and non-veg side dishes. It also works a wholesome and healthy lunchbox meal for kids. Matar Pulao is a versatile rice dish and you can make it in different ways by changing the spices. You can also introduce other vegetables such as potatoes and carrots to this recipe. Peas are a rich source of fiber and protein that helps to enhance satiety. Lutein found in peas works as an antioxidant and protects the cells and eyes. Jeera Rice is an immensely popular rice recipe from North India that holds an important pace in Indian restaurant menu. It is a simple and easy recipe in which the rice is flavored with cumin seeds (Jeera). It is mild and non-spicy and yet it breaks the monotony of plain rice. It can be served with dal, chicken curry or vegetarian side dishes. The best thing about Jeera Rice is that it is simple and light that makes it easy to digest. It makes minimal use of oil, ghee and spices and is suitable for health conscious individuals. Raw Mango Rice is a popular rice dish of Andhra cuisine which tastes almost like Lemon Rice, plus the refreshing flavors of raw mango. Mango rice forms a complete meal and can be consumed by itself thanks to its mild tangy taste and delicious aromas. It also makes a perfect lunch box recipe for kids and grownups. 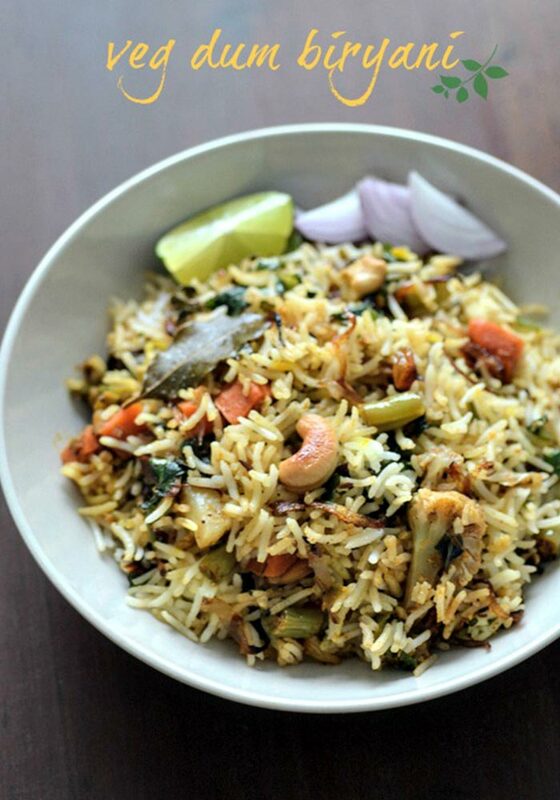 This is a light and flavorful rice dish that does not make use of too much oil or spices. Raw mango is extremely effective in relieving indigestion which makes this recipe suitable for those suffering from digestive problems. This is the simplest and easiest way to make use of left-over rice. The refreshing flavors and tangy taste of lemons combine with the spices to create a spectacular dish. It is a one-pot dish that can be eaten alone or with raita, chutney and papad. Being a versatile dish, you can introduce other vegetables such as cucumber, carrots, etc. to it. This is yet another light and healthy rice recipe that makes minimal use of oil and spices. The flavors and taste of the rice has to be attributed to the lemon. The lentils used in this recipe enhance its protein and fiber content and makes is more filling. 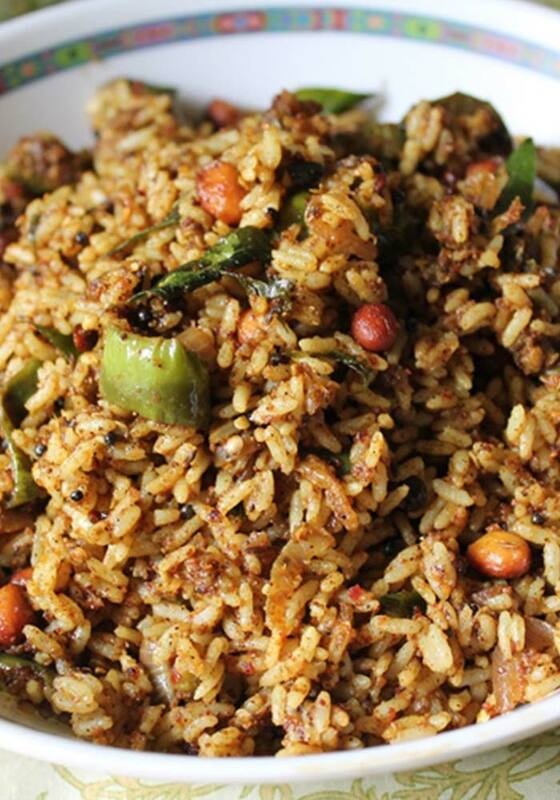 Pulihora or Tamarind Rice is a special traditional dish of Andhra Pradesh that is often served in Temples as a Prasad. 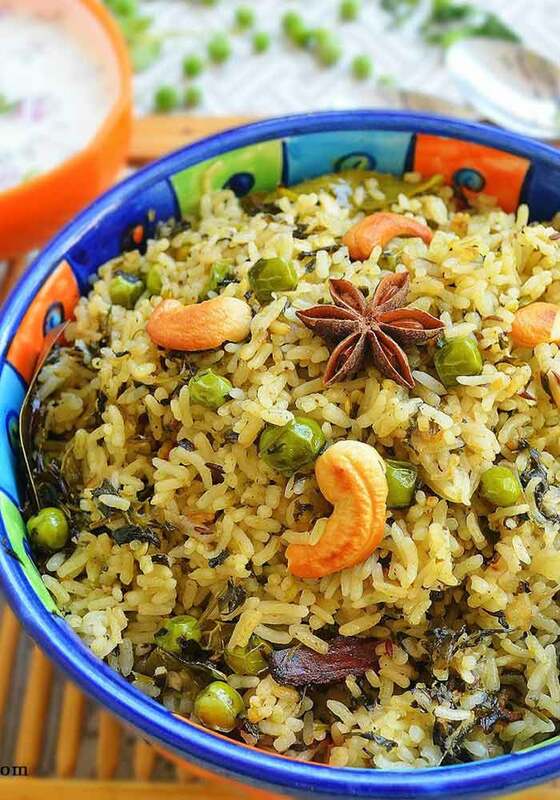 Tamarind rice is marked for its delightful tangy and spicy taste along with the nice crunchiness of nuts and lentils. You can have it alone or with cucumber raita or coconut chutney. 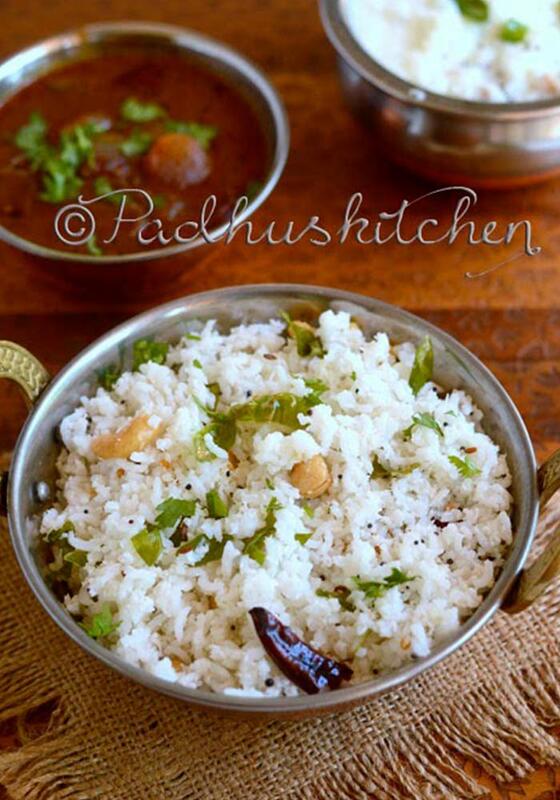 This is a tasty and flavorful rice recipe that does not use any heavy spices, ghee or butter. The inclusion of nuts and lentils enhance the protein and fiber content of the dish. Tamarind used in the recipe is a rich source of thiamin, iron, magnesium, calcium, vitamin C, copper and powerful antioxidants. Tomato Rice is a flavorful and tangy one pot meal that can be prepared in a jiffy and enjoyed for lunch or dinner. It can be cooked in a pressure cooker or pot and it makes the perfect lunch box meal for kids. It can be eaten alone or accompanied with raita and chutney. Tomato Rice or Pulao is a versatile rice recipe and you can include your choice of vegetables to it. Fresh tomatoes used in this recipe are a potent source of lycopene that improves skin health and reduces the risk of several types of cancer. Pudina Rice or Mint Rice is an exceptionally aromatic and flavorful rice dish that is easy to prepare and can be enjoyed by the whole family, including kids. The refreshing aroma of mint combines with the flavors of the spices to create an appetizing dish. The mint leaves combine with the rice and renders an attractive color to it. Menthol present in mint leaves helps to relieve indigestion which makes this recipe suitable for people with digestive problems. It also helps to relieve cough and cold, fight infections, beat stress and boost immunity. The phytochemicals also helps fight cancer. Coconut Rice or Thengai Sadam is a popular traditional rice dish of South India that is marked for its tropical coconut flavors. It makes a delicious one pot meal that can be eaten alone or served with curries. The freshly grated coconut adds a mild sweetness to the dish. The healthy monounsaturated fatty acids present in the coconut flesh aids in weight loss and reduce the risk of obesity. It protects the brain against degenerative diseases and improves the levels of healthy HDL cholesterol in blood. Curd Rice is the ultimate comfort food that soothes the digestive system and refreshes the taste buds. It is a complete meal and is hugely popular all over South India but the recipe involves only a few humble ingredients. The rich, creamy and buttery taste and appetizing flavors of Curd Rice makes it an irresistible dish. Being a simple, light and non-spicy recipe, it is easy to digest. Fresh curd used in this recipe is a powerful source probiotics (gut-friendly bacteria) that improve digestion and boosts the immune system. Curd is also a rich source of calcium, protein, vitamin A and vitamin D.
Vangi Bhat or Spiced Brinjal/Eggplant rice is a classic Andhra rice dish known for its savory and flavorful taste. It is an extremely flavorful dish that you can enjoy with some raita and papad. The lentil and peanuts seasoning add a nice crunch to the rice, while the Vangi Bhat Powder renders some vibrant flavors to it. The lentils and nuts used in this recipe make it all the more wholesome and filling. Antioxidant phenolics found in eggplant are powerful free-radical scavengers that reduce the risk of cancer and heart diseases. Bhindi Rice or Vendakkai Saddam is a Chettinad style rice preparation that is marked for its delicious tangy and spicy taste. It is a complete meal that can be eaten alone or in combination with raita or curd. It also makes an interesting lunch-box item for kids. You can adjust the spiciness of the dish as per your taste. Bhindi or okra used in this recipe is a rich source of vitamin C, protein, dietary fiber, folate and magnesium that lowers cholesterol, manages diabetes, boosts the immune system and prevents kidney disease. Methi Pulao or fenugreek flavored rice is a tasty and healthy rice dish that is popular all over India. People of different regions prepare it in their own ways. The appetizing flavors of the whole spices, fresh herbs and Basmati rice combine together to create a wonderful meal. Methi leaves or fenugreek leaves used in this recipe is a good source of iron, vitamin K, protein and fiber that helps to cure anemia, regulates insulin levels and improves digestive health by relieving constipation. 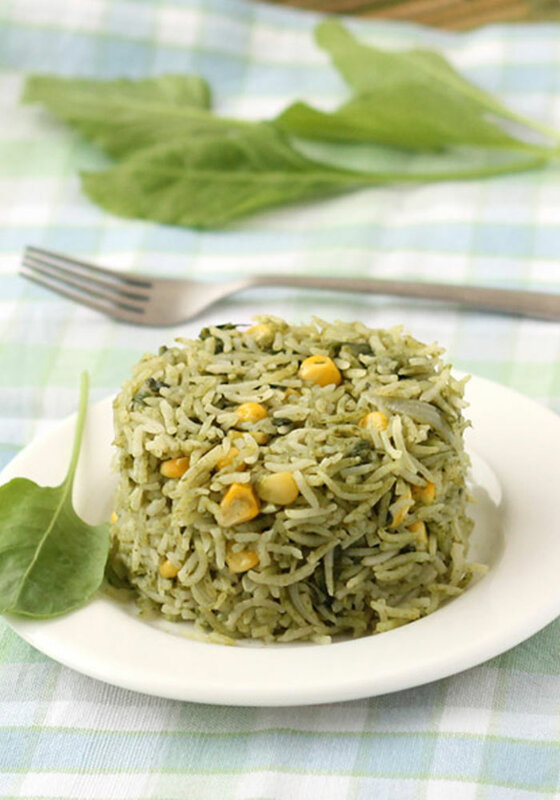 Palak Pulao or Spinach Rice is an easy to prepare Indian rice dish that is bursting with flavors and taste. It is a great way to introduce more leafy greens into the daily diet. The sweet corn kernels add a nice crunch and hint of sweetness to the dish. It makes an interesting lunch-box idea for kids. Palak or spinach is loaded with iron, protein, fiber, vitamin A and antioxidants that helps in diabetes management, prevents cancer, improves bone health, prevents constipation, cures anemia and helps to maintain healthy skin and hair. Taheri is a simple and wholesome rice preparation from eastern Uttar Pradesh that is marked for its flavorful and aromatic nature. It is a complete meal on its own consisting of savory vegetables and aromatic basmati rice cooked together and served with plain curd. Taheri is an extremely versatile dish and you can enhance its nutritional profile by adding a wide variety of vegetables to it. The fresh cauliflower florets, green peas and potatoes used in this recipe add some dietary fiber, carbohydrates, protein and vitamins to the dish. Indulge in the rich and royal taste of Awadhi cuisine with this delicious and flavorful Zafrani Pulao. This recipe involves a mixture of rich ingredients such as saffron, whole spices, nuts, raisins, etc that are cooked together with the aromatic Basmati rice. It has a mellow sweet taste that goes well with savory curries, kebabs and korma. Saffron used in this recipe is a priceless spice, well known for its healing health benefits. Carotene crocin in saffron protects against cancer, boosts memory and learning, treats Parkinson’s disease and provides protection against cold. The Channa Pulao is a simple and wholesome dish that can be prepared in a jiffy and is the perfect meal for those days when you don’t have the time or energy to cook up an elaborate meal. It is a complete meal that can be enjoyed with some raita and salad and it also makes a delicious lunch box recipe for kids. Chickpeas or Kabuli Chana used in this recipe helps to supply protein and dietary fiber to the body and makes it a wholesome and filling meal. The fiber helps to lower cholesterol and benefits the digestive system, while the high-quality proteins aid weight loss and increasing lean muscle mass. It is also a good source of minerals iron, zinc and copper. Misti Pulao or Bengali style sweet pulao is a popular Bengali rice preparation marked for its mellow sweet taste and appetizing flavors. It is also referred to as Basanti Pulao or Holud Pulao. The mellow sweet taste of the pulao goes well with savory mutton curry and the delicious due makes for a wholesome Sunday lunch. Basanti pulao can be a bit rich and oily, so it is best to enjoy it as an occasional treat. The saffron, nuts and raisins used in this recipe notch up its health quotient and adds some much needed fiber, healthy fats, antioxidants, vitamins and minerals to it. 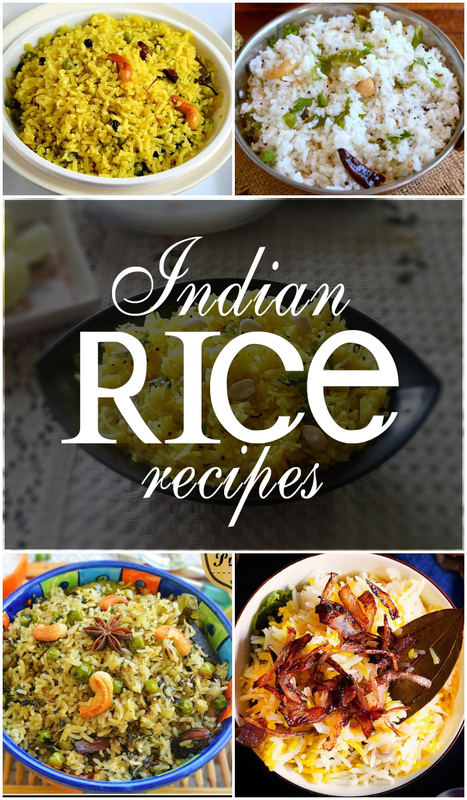 So, forget the same boring steamed rice and start experimenting with this versatile ingredient in your kitchen by following these amazing Indian rice recipes.